>Oh, bugger it. We had the hat-trick of dinosaur-themed bands the other week, and it should be clear to you regular readers by now that we love gimmicks just about above anything else here at A New Band A Day. So, after yesterday’s super Glaswegian Scrabble-fiends* Q Without U, we’re going for broke and pumping two more Glasgow bands at you, today and tomorrow. Glasgow, similarly to issues we’ve expounded limply about Wales before, must have something special in the water (no jokes about Tennants Super, please) as the city is churning out superb bands left, right and centre at the moment. So, Today’s New Gimmickly-Induced Band is ERRORS. If I was mildly cretinous, I’d make a poor joke about how there is nothing erroneous about their music, because it’s fantastic. Unfortunately, I am that cretinous – there is nothing erroneous about their music – they sound exciting, inventive and are so pleasingly non-Razorlight/Kooks/etc that I almost did a backflip listening to them. To be slightly glib, they sound a bit like A.N.B.A.D. favourite PixelH8 coupled with the gloriously noisy Battles. You honestly have to hear Salut France, a song with all the skippy beats, gorgeous melodies and bleepy poking you’ll ever need. Focussed and sharp, but without falling into that awful laptop featurlessness like most electro-noise bands. You could dance to them, you could strut around town to them, and if you were pretentious, you could stroke your chin to them. Whatever you do, just listen, because they’re SUPER. Listen to them, quick! Myspace here. More Glaswegian bands tomorrow! Posted on June 5, 2008 by Joe Sparrow. 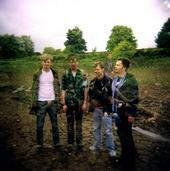 This entry was posted in "Brilliant" Bands, Today's New Band and tagged bleeps, glasgow. Bookmark the permalink. ← >TREMBLE IN FEAR! Brand New A.N.B.A.D. Radio Show!